little when I see it - it's okay! creative outlet, a stress reliever, an opportunity to use my hands, a moment to look forward to and a reason to push myself every day. I had the amazing opportunity to do an Instagram takeover in early January for @52Quilters. This social experiment features different quilters from around the world every week. In past years, each quilter simply shared their quilty world. In 2018, Chris, the founder, decided to develop a theme for each month. January was well-being and I was so excited and honored to discuss this topic. Wellness is a key part of my life. I’ve written on my blog about running being an important part of my life (and how it directly relates to quilting). Quilting is also a part of my wellness strategy. I firmly believe that from designing a quilt, to piecing it, to hand-binding it is therapeutic. 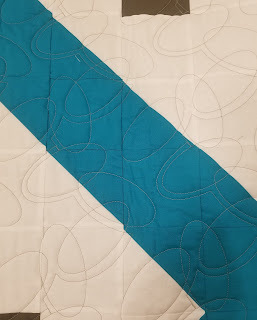 Angela Walters has built part of her reputation on the phrase “quilting is my therapy” and I completely agree with that sentiment. I’ve always held onto this belief that I have to be perfect. Maybe not literally perfect, but I need to project myself that way as often as possible. I could not be more NOT perfect than if I tried. It makes me laugh to reflect on what “perfect” used to mean to me and what I understand it to be now. Perfect is unattainable. Frankly, it’s selfish. It’s also boring. I blame no one but myself for this desire. Sure, like many kids, my parents pushed me to TRY. Somewhere along the away, I equated that with perfect. I own the blurred vision I created in my own mind. And now I am learning to break free. Most of that is thanks to running and quilting. Quilting has changed my perspective on so many things. Learning that I don’t have to be perfect and that I can still produce a beautiful and useful result has been rewarding. It’s also continuing to teach me to laugh off the small stuff. If you follow me on Instagram, I recently shared how I completely messed up a paper piecing project I started. I am basically 100% behind on a QAL I joined, but I finally got started and when it came time to lay out the pieces of the first star to sew together, I realized something was wrong. I had sewn to the wrong side of the paper, thus the pieces wouldn’t line up correctly. This is not even close to my first paper piecing project! I know better! I was so embarrassed and mad at first. And then I laughed. It’s just time and fabric. Of course I value my time and fabric, but in the scheme of everything in life, it’s okay! I reminded myself of that several times and I moved on to a correctly sewn version. It’s one of the few times that I truly just let it go! And my well-being is so much better for it. What are your goals for 2018? How will you own what you do?